A short biography of Paul Signac a French neo-impressionist painter and anarchist who, working with Georges Seurat, helped develop the pointillist style. Paul Signac, like his fellow Frenchmen Camille Pissarro and Maximilien Luce, was both an outstanding artist and an anarchist. He was a theoretician of new painting techniques, a lover of the sea and sailing and a ‘discoverer’ of St Tropez. Born into a bourgeois family, he never had any financial problems and could paint in good conditions. After having seen an exhibition of paintings by Monet in 1880, he decided to finish his studies and become an Impressionist painter. His first paintings represent the quays of the Seine at Asnieres and the seaside. In 1884, at the Salon of Independent Artists, he met Georges Seurat and adopted his new techniques of painting. Neo-impressionism was born. The colours used were pure, applied in little touches to give maximum luminosity and harmony. 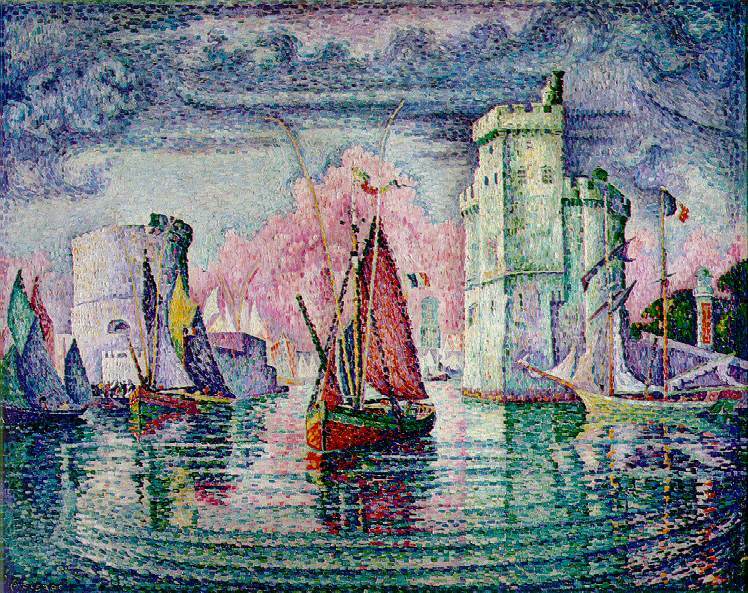 Signac used scientific theories of colour in his work. He thought that the effect science could have on art was revolutionary. Like Luce, Signac wanted to put over life of workers and peasants in his paintings. So one of his paintings includes gasometers on the border of town and country. He also painted interiors of bourgeois houses where the people represented have a sinister air. In 1887, he painted pictures of the port of Collioure, the following year that of Portrieux. A lover of the sea, he visited the Mediterranean coast in 1892 and discovered St Tropez. Like Emma Goldman and Alexander Berkman, the exiled Jewish American anarchists who lived here in the 1920s, he found St Tropez charming and not at all the den of the rich that it is today. In 1888, Signac discovered anarchist ideas by reading Elisee Reclus, Kropotkin and Jean Grave, who all developed the ideas of anarchist communism. With his friends Angrand Cross, Luce and Pissaro he contributed to Jean Grave’s paper Les Temps Nouveaux (New Times). His financial support was considerable; he sent regular cheques and made a gift of his works for five lotteries between 1895 and 1912. But the art of the militant did not attract him and, unlike Luce, he only provided five drawings and two lithographs to the paper. He thought that the subject did not count for much in art. For him, what was revolutionary was the search for harmony which, he thought, contributed to the struggle against ruling class conventions. He felt that many great artists had been maltreated in the past and saw the history of art in a political manner. He advocated the need for social revolution alongside the need for artistic freedom. He saw anarchism as the best guarantee of the latter. He thought that it was up to each individual artist how best they served the movement. "The anarchist painter is not the one who will create anarchist pictures, but he who, without desire for recompense, will fight with all his individuality against official bourgeois conventions by means of a personal contribution." Nevertheless, it is interesting to study two anarchist paintings that are a reflection of his ideas. In the ‘The Demolition Workers’, two workers are demolishing buildings representing society, whilst on the horizon the sun of anarchy is rising. In ‘The Time of Harmony’ a huge painting originally destined for the House of the People in Brussels, an idyllic version of the future society is represented. This was painted in 1894, in the year when individual attacks by anarchists on members of the boss class were at their height. In this work, activities of work and leisure are peaceful and in total harmony, though Signac can be criticised for his typecast roles for the sexes. Signac’s work would have an influence on the new art, on the Fauves and the Expressionists. In 1904 Matisse came to paint with him at St Tropez. The First World War was deeply traumatic for him. He was disgusted by the way Kropotkin, Grave and other anarchists (a minority in the movement) had become supporters of the war. These were people he had greatly admired. He was demoralised and could not paint for three years. He took part in activities for peace alongside the writers Barbusse and Romain Rolland, as he considered himself an internationalist. In 1917, the Russian Revolution filled him with hope. After the war he began to paint afresh, with landscapes of Brittany, Normandy, the Atlantic coast and Corsica. He became President of the Salon of Independent Artists, which permitted young artists to exhibit. A year before his death he mobilised with other artists and writers like Gide in the Vigilance Committee of Antifascist Intellectuals. His last paintings represented great sailing ships, witnesses, like Signac, of a world that was fast disappearing.